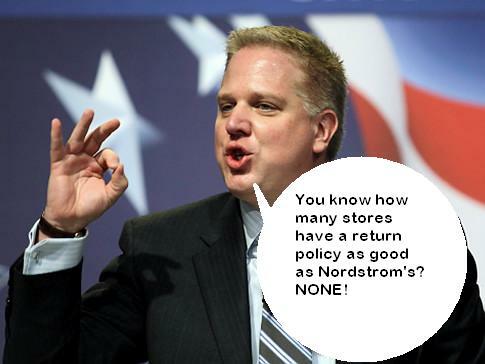 Glenn Beck wants to take back America….to Nordstrom’s. Home → Damien Zone → Glenn Beck wants to take back America….to Nordstrom’s. “Why not,” said the blockheaded Glenn Beck from the big mall at Alexandria, Virginia. 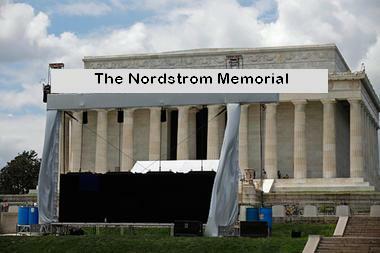 “Nordstroms will take back anything — even if it is over 200 years old. 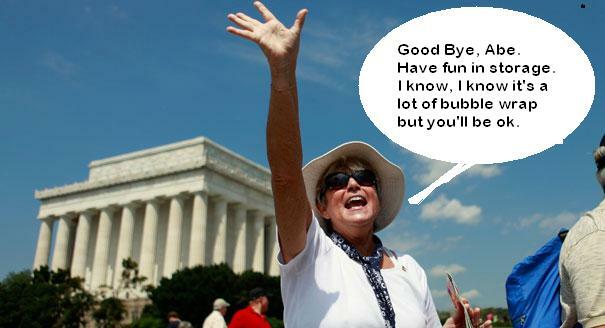 There was a lot of hoopla over Beck’s recent rally in Washington, DC. People thought he was doing this or that or that perhaps he had some great agenda but in reality all he was trying to “bring back” was the whole country because it didn’t fit him and he figured that Nordstrom’s would take it since they take back anything. Nordstrom’s lived up to its reputation and plans are now being made at Nordstrom’s to take back America. “We will be needing a lot of trucks –maybe a billion, ” said Julius Bamberger, the owner of Nordstrom’s who also works at the returns counter on weekends. “We are not sure where we can store all of America and we are still calculating what we will have to pay Mr. Beck but there seems to be a bit of a conundrum. Nordstrom’s has opened a 1,00,000 square mile warehouse in Antarctica where it can store America until it either gets resold or gets sent back to the factory. The holding company has already bought every airplane and truck in the world. Maine, Vermont and New Hampshire have already been returned and millions of people have found themselves wandering around inside a huge dome filled with food processors and clothes from the 1960s. So Glenn Beck has made his dream come true but now where will he shop? Unfortunately Becks patriotic statement did not have the impact he thought it would have, because when he turned around to that “big man made of marble” it was already being hauled away by guys with pulleys and winches and a giant Nordstrom barge that was docked in the Potomac River. Yes, Abe Lincoln is going to Antarctica too. John Lennon's toilet sells for $14,740 at UK auction -- too bad it was flushed.